This is so emotional for me because i've been struggling with my weight ever since I hit menopause. It's been fluxuating up and down like a seesaw and i've never seen an actual real life improvement until now. Just to give you a little insight, i'm 54yrs old and i'm 5'7", my highest weight was at 145lbs. I couldn't fit in any of my size 4 jeans so I basically only wore stretch pants and leggings. I was exercising twice a day and I still couldn't get my weight past 145lbs for the life of me, no matter how hard I tried. Enter juicing. I wrote a post on New Year's Day, which you can read HERE about changing my lifestyle and incorporating juicing into my daily nutritional routine. 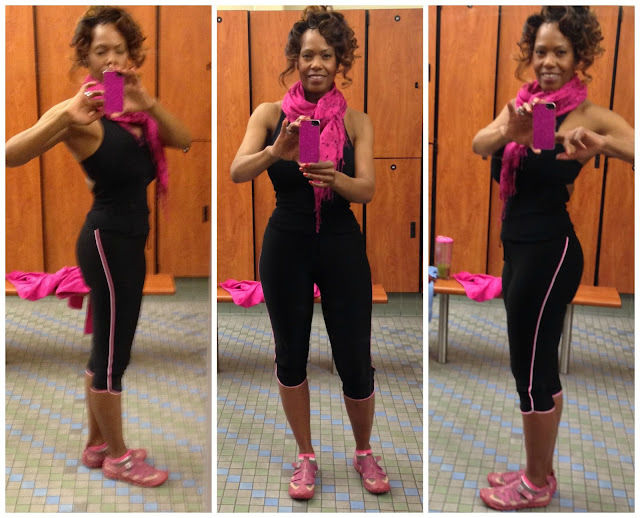 Because of juicing, my body decided to give me a reprieve and shed some of the fat stored due to menopause and aging. These photos are after a week of juicing, but I did eat solid foods also. I drank a 24oz green drink twice daily, between drinks I ate an 8oz cup of yogurt. I had a normal dinner, I cooked things like Lasagna one night, Salmon, Tilapia, etc. I didn't eat any chicken or turkey and I only ate fish. I even made tuna sandwiches one night because it was too hot to cook. I still had to cook for my husband so a total juice fast wasn't in the cards for me. I know so many people in the Juicing For Dummies Facebook Group do extreme juicing for days on end, but I didn't feel I had major fat to lose so I just decided to do half day juicing instead. In one week ( Sat to Sat) I lost 4.5lbs. I'm very proud of my body for giving me a break and shedding some belly fat. I didn't take full body photos but I did notice some fat loss around my thigh areas as well. I have a post if you're curious to see what I put in my juice HERE. In addition to the fruit and green veggies, I'm also adding Kale, Spinach and Kiwi. I now juice two separate containers. I juice all the yellow fruits (oranges/pineapples/mangos) by themselves, then I juice the green veggies (kale/spinach/kiwi/green apples/cucumbers/celery) and store then in air tight mason jars. I'm not sure what my goal is, I just want to feel healthy, lean and toned. I will do another comparison in Feb, just to see where i'm at. I do believe that my weight will stabilize at some point and i'm curious to see what that weight/size will be..... stay tuned!